Have You Tried a Spending Diet? Since Christmas has passed, my husband and I have been on something of a spending diet. It hasn’t been a conscious decision; we’ve just been a little too busy to worry about buying things, and, besides, it seems a lot like overkill to go out and spend money after the most materialistic of holidays has just passed. Our spending plan hasn’t changed. We just haven’t found anything that we really care to spend money on. But I do know that a lot of people going on “spending diets” this time of year. The whole concept of a spending diet interests me, even though it’s not something I’m likely to actively participate in. What is a Spending Diet? A spending diet is a commitment to spend as little money as possible for a set period of time. Sometimes a spending diet is also called a spending fast. The idea is that you spend only on the things you have to. So, you would keep paying your bills, and make sure that you buy groceries. Everything else is cut from the spending, though, so you aren’t buying things you don’t need (and probably don’t want anyway) and so that you aren’t getting into debt. 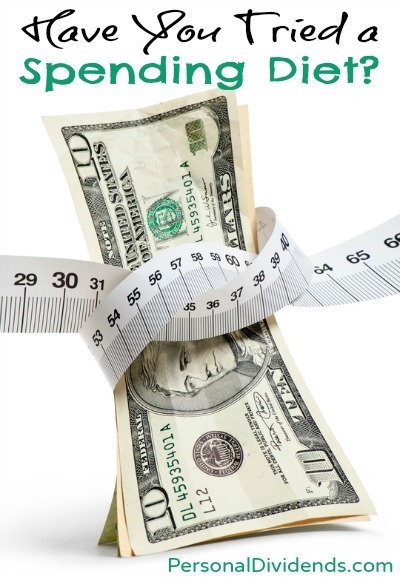 One of the reasons for a spending diet is to cut out the fat and save a bunch of money so that you can apply it to credit card debt, or put it toward another goal. I kind of like the idea of a spending fast or a spending diet because it can also force you to figure out your financial priorities and determine what items you truly want to spend on going forward. One of the problems with our consumer culture is that we often mindless spend. Credit cards make it easy to just swipe, without paying attention to how much is being spent. Additionally, too often we buy things without thinking about what we’ll actually do with them. It’s “normal” to buy these things, so we do. The spending diet forces you to look at your spending, and figure out what really is a need, and what is actually a want. I like this approach because it forces you to evaluate your values and priorities, and then spend consciously. If done right, a spending diet has the potential to help you clarify your long-term financial goals, and figure out how to best reach them. Your spending diet can be just the thing to help you reform your finances — but only if you make changes during the time you are on the diet. In dieting, there are cycles. Once you stop dieting, your weight creeps up because you are no longer actively enforcing the rules that you used while on the diet. Unless you change your lifestyle, the good of your diet will be undone, and you could potential gain even more weight than you lost. The same is true of your spending diet. If you go on a spending diet for a month, and then return to your old habits immediately after you are done, there is a good chance that you will be back to square one in no time. A spending diet only works if you make an effort to change the way you spend your money permanently. Use a spending diet as a chance to reflect on your financial choices, and think about what you want to do with your lifestyle. Then make the changes to your lifestyle that are needed to maintain your financial situation. If you can actually change your habits, you will be in a better place in the long run, and your diet will be a success.